The National Weather Service said Wednesday afternoon they found evidence of an EF-0 tornado near the border of Watauga and Keller in North Tarrant County. An EF-0 tornado would have wind gusts up to 72 mph. 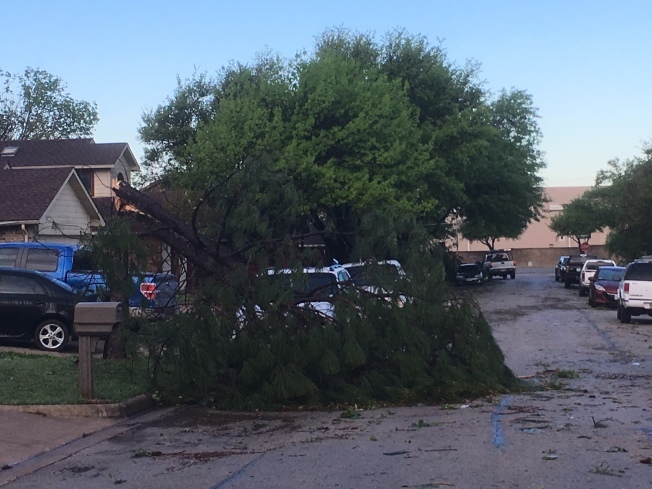 Working tirelessly along Rufe Snow Drive, a Keller city crew told NBC 5 they had already cleaned up dozens of downed trees along that roadway. Power workers were also seen on North Tarrant Parkway, replacing poles that had snapped in half during the Wednesday morning storms. Keller’s nearby The Home Depot became its own customer—in need of cleanup. NBC 5 viewers reported some of the store’s sheds received damage and wood could be seen scattered in the store’s parking lot. NBC 5 Meteorologist Rick Mitchell surveys the severe storm damage in Keller. 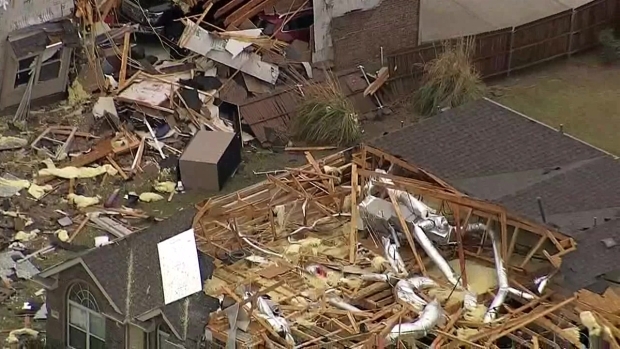 Keller resident Arlene Plante said she and her husband moved from Canada to Texas for the warmer weather, not expecting the damage caused during severe weather season. Her backyard had wall decorations and table tiles thrown and broken. The wind also took hold of her propane heater. Then there’s the roof damage to her home of five years. “The worst hit was right over our master bedroom,” Plante said. Just a few shingles missing on the outside—let the rain inside. “And I could literally hear it running like a faucet had opened,” Plante said about the leak in her roof. That leak left ceiling damage and a soaked carpet. “The good thing is, I told my husband I wanted to replace those carpets. Not a good way to get it done, but...” Plante said with a laugh. Just a few blocks away from Plante’s home, TCC math teacher Duc Phan was trimming a yard-full of branches. Phan got the day off work because of the school’s power outage. So, instead, he’s cleaning up his in-laws’ yard. Tree limbs had covered their car and driveway, while their neighbor had a tree, split in half, blocking their entryway. Phan’s cleanup is just about finished, but city crews and many other homeowners will continue their work in Keller on Thursday.